It’s confirmed, I’m pretty much addicted to scouting Craigslist for furniture. Living on a rock in the middle of the Pacific ocean, means a girl has got to get creative with her limited home furnishing options. Not gossiping about my rock at all, no no! I love my rock in the tropics (Maui that is) but being in an isolated place does present it’s challenges. Since we’re lacking fun affordable furniture stores on the island, I turn to Ross, Craigslist and thrift stores for home decor and makeover projects. 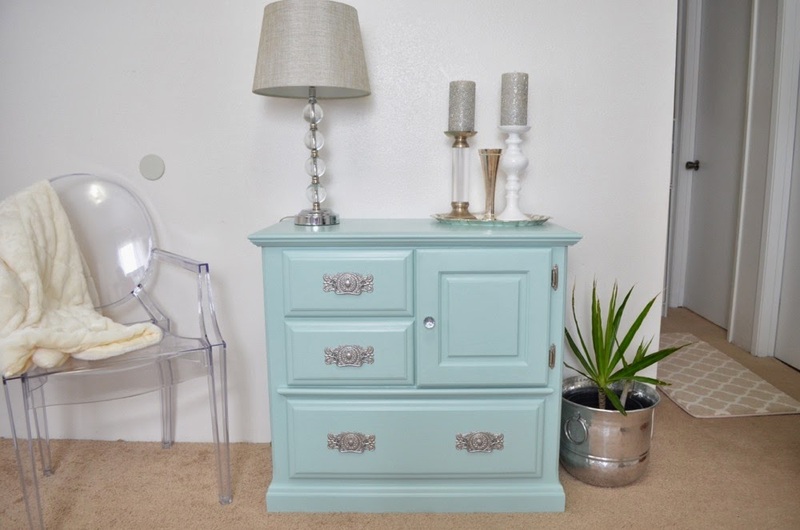 Here’s our most recent DIY Craigslist furniture makeover. I strike out A LOT on Craigslist. 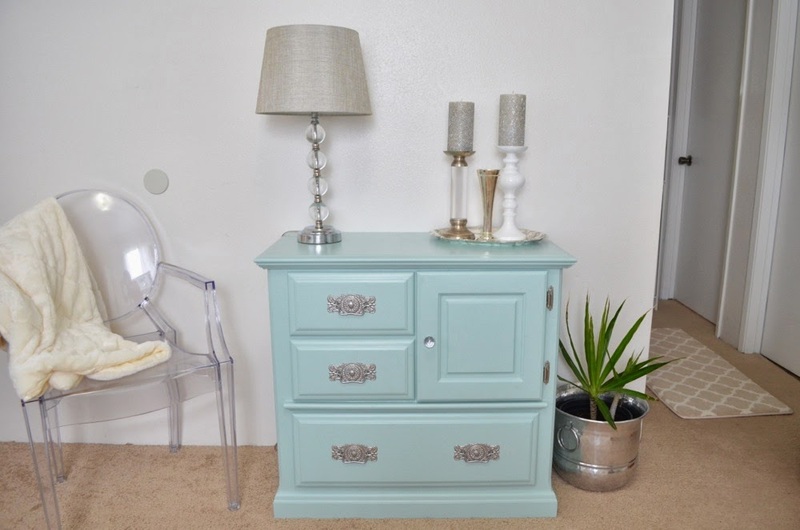 But every once in awhile the planets align and something unexpected happens… Someone actually posts a decent piece of furniture for a reasonable price, on our local Craigslist. Not only that, but you call and yes it’s still available and YES you can come over and pick it up right away. This is what keeps me coming back to Craigslist. You gotta kiss alotta frogs before finding a charming toad like this. 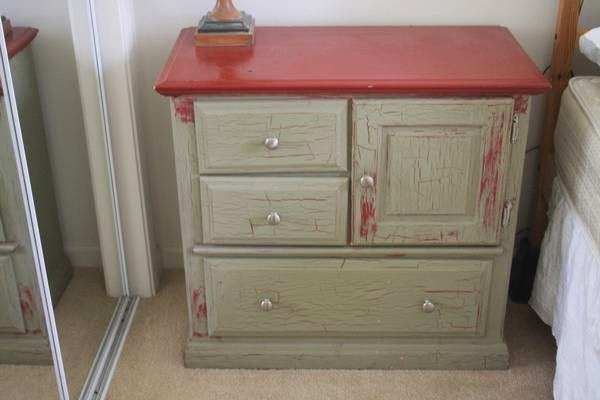 Meet “Big Red” he was painted, uh… xmas red and then topped with split pea soup crackle? Poor thing! This is the original Craigslist picture. There’s Big Red, looking quite embarrassed having his photo taken in this condition. I showed Michael and he basically snorted and laughed. But I could see the potential, it was well built with solid wood construction and for $45 this was a rare find here. So we headed out and had Big Red in the back of our truck within the hour. 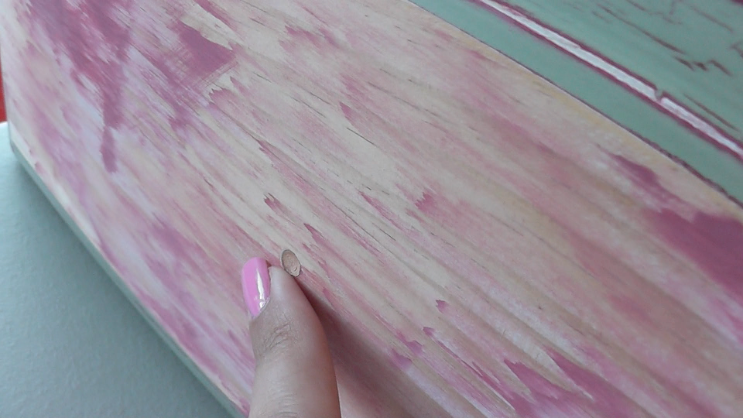 How to remove several layers of paint? 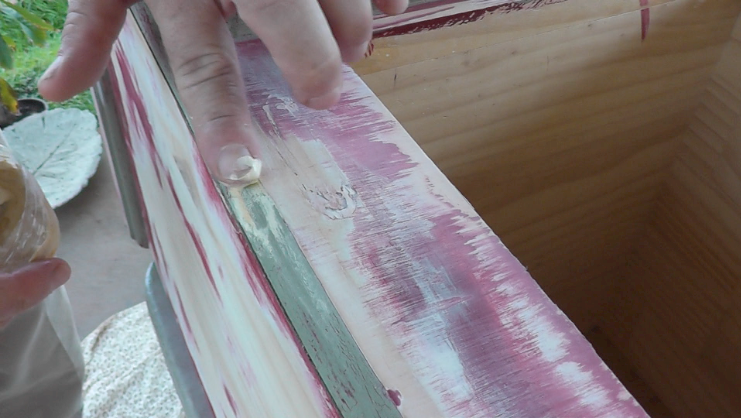 Lots of sanding. I was about to invest in a palm sander but Michael offered to do it all with his heavy duty belt sander instead. 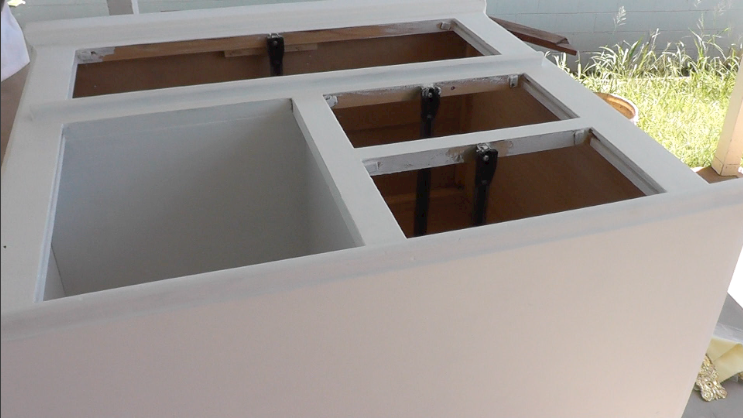 Since I’m replacing the knobs with drawer pulls, we filled the holes where the old knobs were previously drilled. We also filled any dings, to help create a smoother finish. 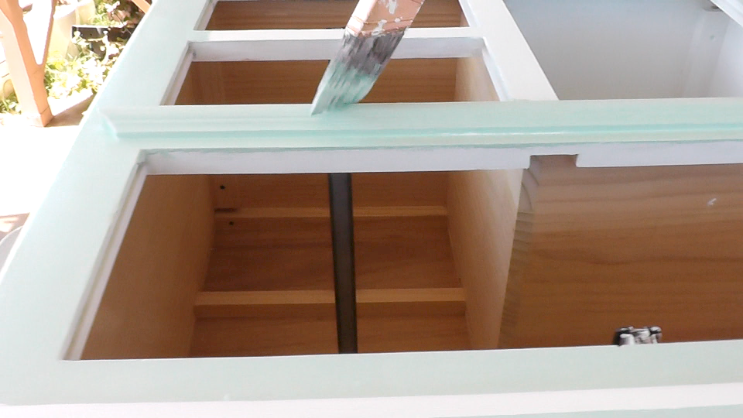 We used some leftover Durham’s putty from a previous project but any wood filler should do the trick just fine. 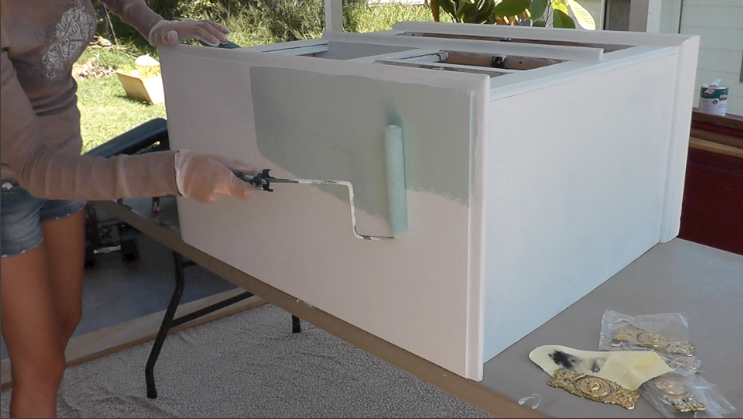 We did two coats of primer and Big Red was lookin’ better already. For the paint, I chose Behr Marina Isle. 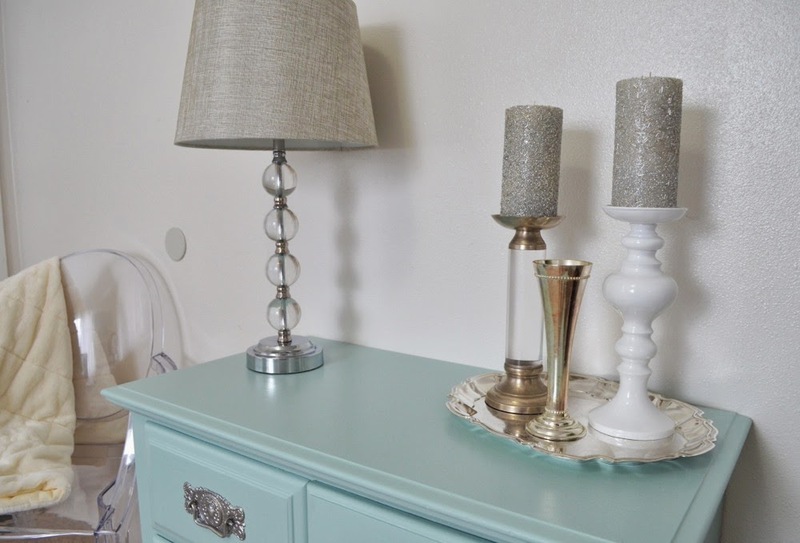 Which I’ve been totally obsessed with ever since I saw Virginia from LiveLoveDIY give Vern his original makeover here. I was like holy cow, I need this color in my life asap. 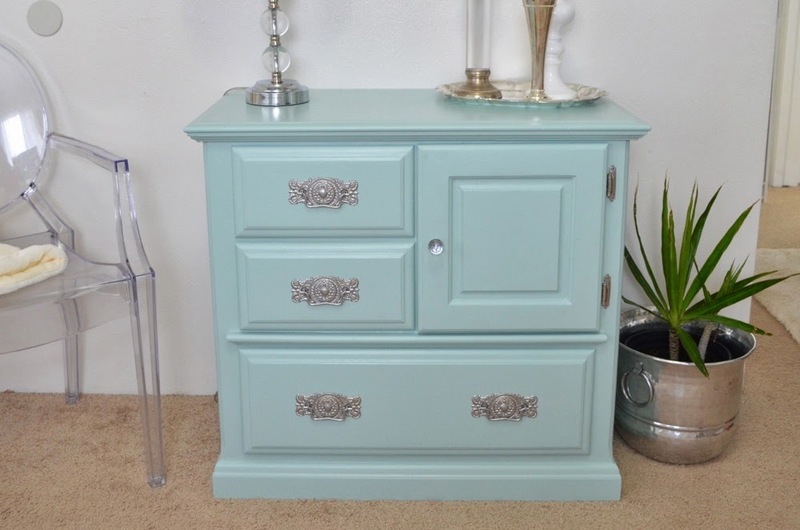 So a huge thank you to Virginia for inspiring this project and getting me hooked on this fabulous paint color to match my minty aqua obsession. Virginia is a super creative DIY’er and all-around awesome blogger and person. So if you’re not already following her blog LiveLoveDIY definitely head over there and check it out, I know you’re going to love it! 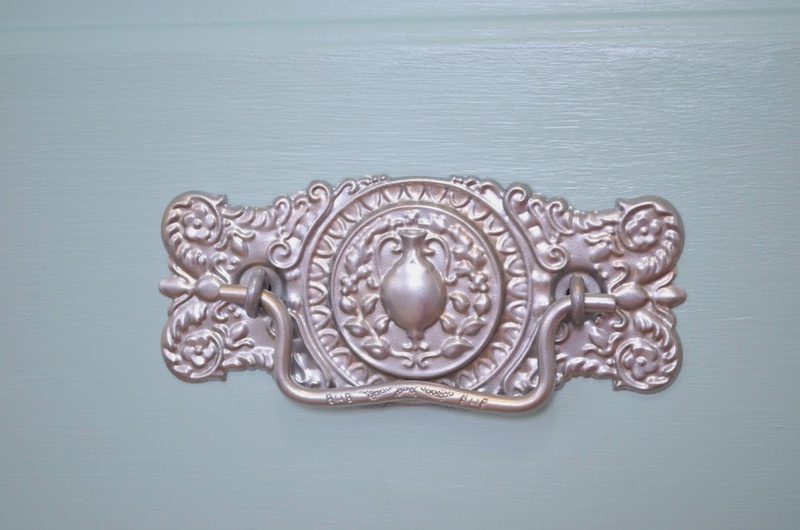 I ordered these fabulous ornate drawer pulls from D. Lawless Hardware online here. They have an awesome selection of hardware at really affordable prices. 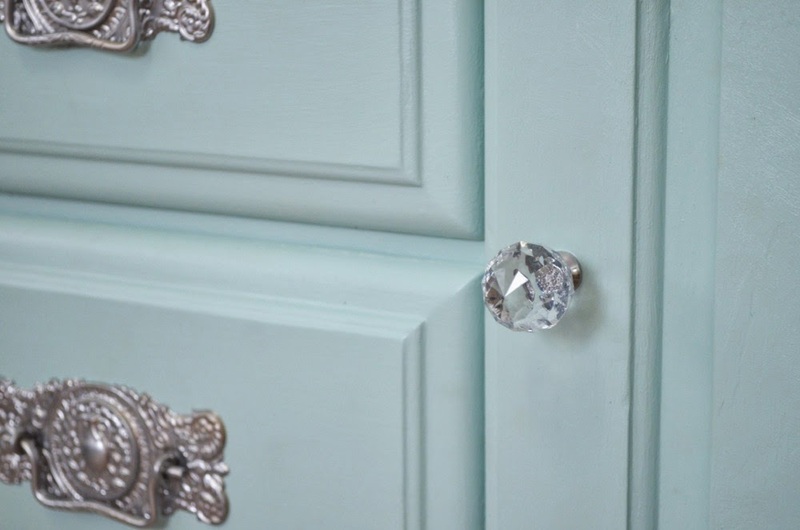 I actually ordered several different designs from them, including a few totally glam acrylic crystal knobs. Again, inspired by Virginia, thanks girlfriend! 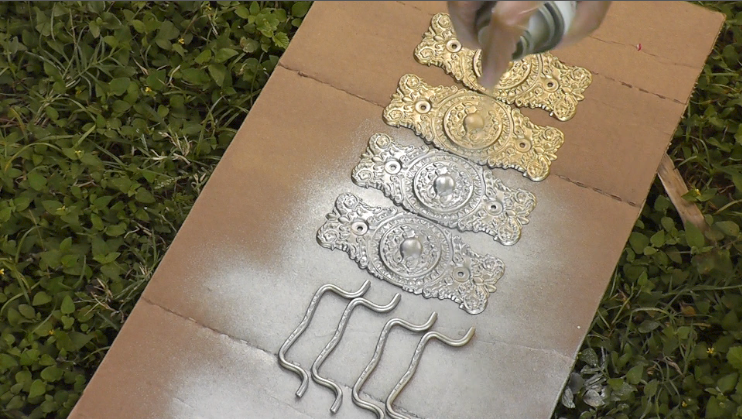 I planned to spray paint the new drawer pulls, which are brass. So I gave them a buffing with my 150 grit sand paper, just enough to create texture for the paint to adhere better and wiped them clean. 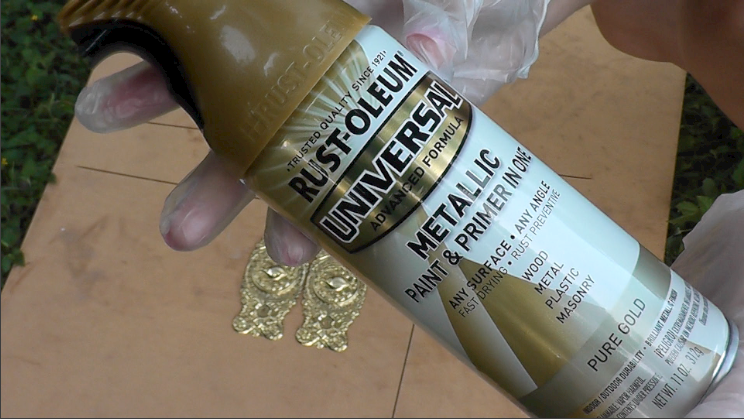 For the first coat, I used Rust-oleum Universal in Pure Gold, it’s a paint and primer in one. 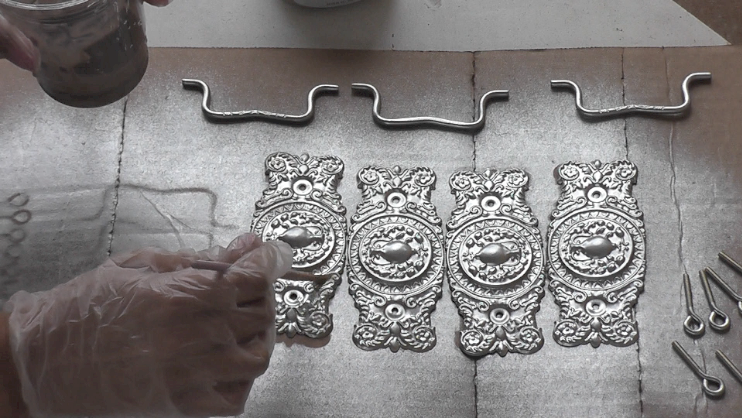 I actually want my hardware silver but this works because it’ll act as a primer (which I didn’t have on hand) and it’s fun mixing up paints for a multi-dimensional look. 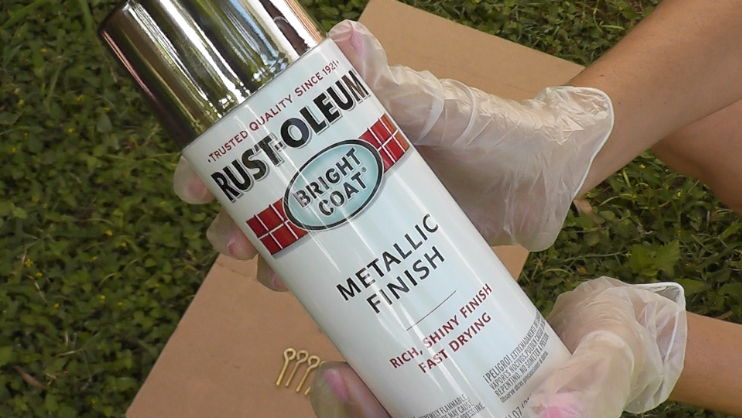 For the silver, I used Rust-oleum Bright Coat. I did one light coat, then decided I wanted a second coat. Wait for it to dry 15 minutes between coats. You know how I love mixing up paints? Yep. 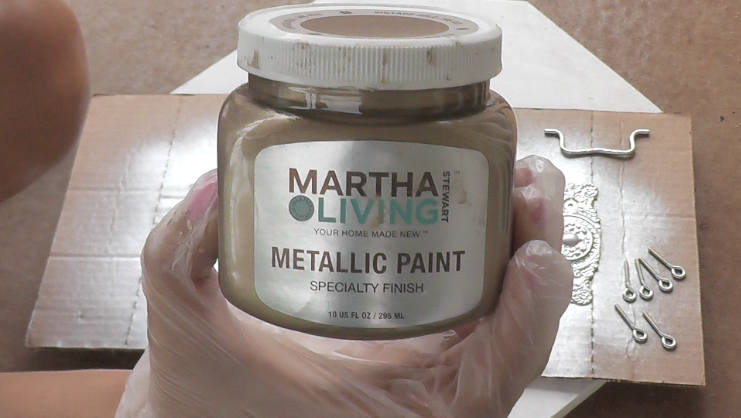 Next I grabbed my Martha Stewart Metallic Paint in Vintage Gold. I put a dollop of Vintage Gold in my iced frappe coffee cup (after I had finished the coffee and washed the cup of course) and added a splash of water. Before we go any further, did you know Costco sells these ice blended frappes for only $1.45?! They’re freaking delicious too! 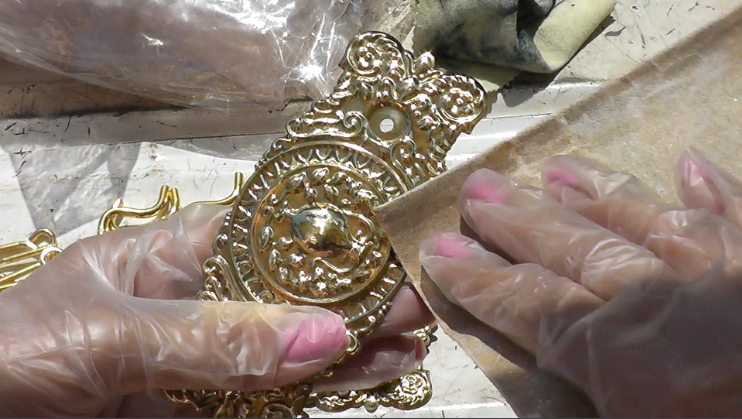 I used a small artist paint brush to apply the Vintage Gold just in the recessed parts of the detail. Then used a rag to wipe off any excess.